May 2018 14 www.sportseventsmagazine.com t GAME Plan often," he said. "Uncertainty and unknowns are rough but teams will be more under- standing if you are communicating about them frequently and transparently." Event organizers must also have a plan for communication during the event, whether tweeting, emailing, texting or using some sort of app. "If there is a big change during your event, ask people for their patience and let them know you're working hard to figure it out as quickly as possible," Raflo said. "People are more patient when you keep them in the know." Think Through The Location It's always tempting when selecting a location to select a city you'd like to visit. But oftentimes, as Robert Pozo of Continental Events and Sports Management Group points out, the best location for your event might not be where you want it to be. "It has happened to me," Pozo said. "What better place to have the event than Honolulu, for example? It sounded great. But in my case, it was too expensive for my target participants and there was a six-hour time difference between my location and Honolulu, making planning really difficult." 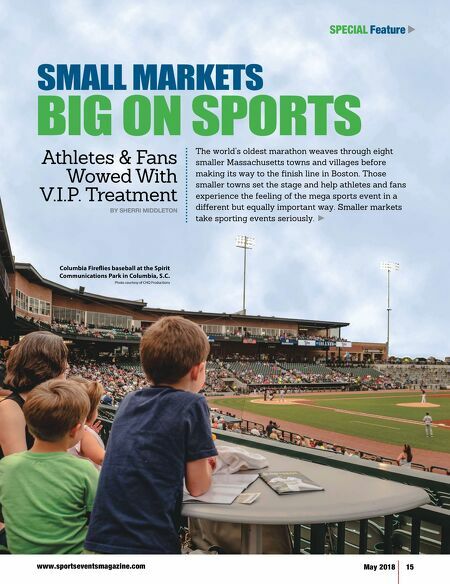 When thinking about the best location for an event, instead of focusing on where you think you'd like to go think about up-and- coming destinations or perhaps cities that recently received grants to bring in sporting events. "They will often bring you in and roll out the red carpet for you and your at- tendees, and potentially give you funding," Pozo said. "That destination might not be what you deem as the best vacation for you or your participants but if you get the best treatment there and the city makes your participants feel right at home, what better place is there for your event? So always keep in mind that the right fit for your event may not be the best location for you." Engage With Potential Participants Year-Round It's easy to think about engag- ing with participants during an event but it's critical to engage with them before and after as well, said Mike Mon of the Asian Basketball Champion- ships of North America. Before the event, utilize marketing to make participants look forward to and appreciate the event. "For example, if you are doing a preview article, include something like 'The Top 20 players to Watch,'" Mon said. "Everyone will be looking forward to that preview." During the tournament, event planners should be constantly posting to social media about what is going on but once the event is over, the communication shouldn't end there. It's important to stay engaged with those participants, Mon said: "Most engage- ment after the event is going to be via email and we typically do email blasts afterwards. We'll send one a couple of weeks after the event to say thank you and that we hope to see them again next year. Then we keep posting things throughout the year. You've got to stay on people's minds." 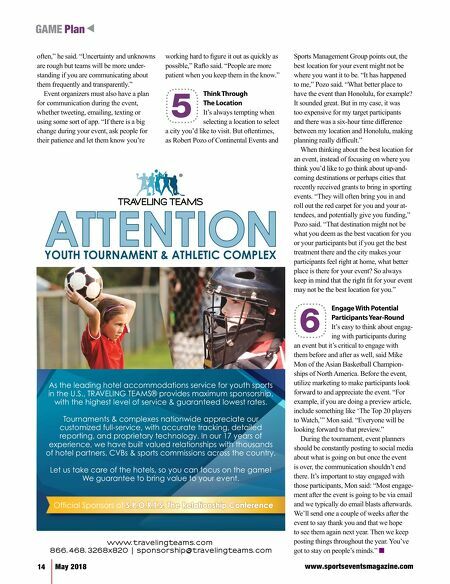 n 5 6 As the leading hotel accommodations service for youth sports in the U.S., TRAVELING TEAMS® provides maximum sponsorship, with the highest level of service & guaranteed lowest rates. Tournaments & complexes nationwide appreciate our customized full-service, with accurate tracking, detailed reporting, and proprietary technology. In our 17 years of experience, we have built valued relationships with thousands of hotel partners, CVBs & sports commissions across the country. Let us take care of the hotels, so you can focus on the game! We guarantee to bring value to your event.